A winning speech wins over the hearts and minds of the audience. Sometimes, it wins the highest scores from judges at a public speaking contest. To reach your audience, first find out about their background, their expectations and concerns. However, do not write to impress a particular audience or judges at a contest. Write from the heart, with passion and sincerity, and you will win over your audience. 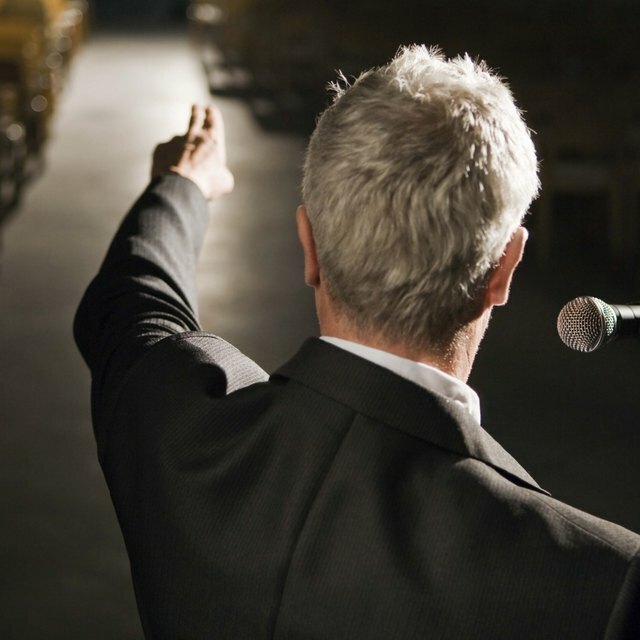 Get the speech details, such as the audience size, composition, venue details and allotted time. Use the information to tailor your speech. For example, a speech to senior citizens is different from a speech to high school students. Prepare the speech outline. Write the purpose or core message, such as "To inform the audience of the benefits of regular exercise" or "To motivate my employees to meet sales targets next year." Write three or four ideas or arguments in support of your core message. Jot down what you want your audience to remember. Write the introduction, which should be about 10 to 15 percent of the speech in length. You can start with an outline of your speech, a personal anecdote or with a question that sets out the theme of the speech. For example, a speech at a charity fundraiser could start with something like "Did you know the number one reason for (ailment)? It is (cause). I am here today to tell you what we have been doing to find a cure and to ask for your support." Complete the body by expanding the arguments in your outline. Add examples, personal anecdotes and quotations. Use simple and direct construction. For example, use "We should ..." instead of "It is my reasoned judgment that we should ..." Do not use big words that you might have trouble pronouncing and the audience might have difficulty understanding. Use poignant language to bring your speech to life. For example, former Illinois senator Barack Obama spoke about his parents at his 2004 Democratic National Convention speech this way: "They're both passed away now. And yet, I know that on this night they look down on me with great pride." In his "I Have a Dream" speech, legendary civil rights leader Martin Luther King said:" Now is the time to rise from the dark and desolate valley of segregation to the sunlit path of racial justice." However, do not go overboard with imagery and other rhetorical devices. Use them sparingly and only to make a point. Repeat your core message. King repeats the central "I have a dream" message several times in his speech. You do not have to use the same words, as long as you repeat the main themes. Write the conclusion, which should be about 10 percent of the speech in length. Do not end abruptly or introduce new facts. Bring closure by emphasizing your core message. Call for action in a motivational speech. For example, you could conclude a speech to your employees this way: "I am proud of what we accomplished this year. Let's work together to do even better this year."